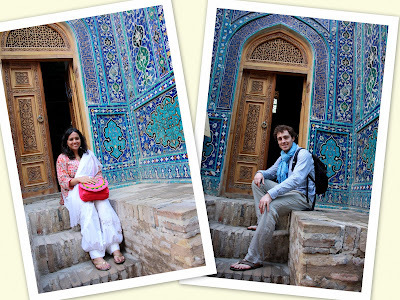 Amidst all that sightseeing, we felt like doing some things on our own. Samarkand is a pretty easy city to get around and we managed to find different routes to go to various sites. so we embarked on our own walking tour to discover the sights and sounds of this city. Our guide had told us that there is a famous street called Freedom Walk and many young people frequent this area. 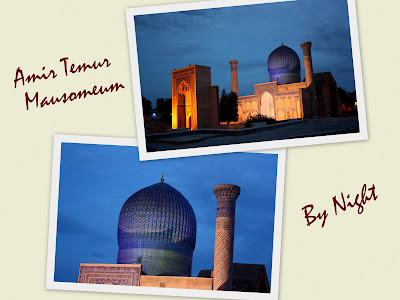 It is a long straight street that connects between Registan and Amir Temur Mausoleum. 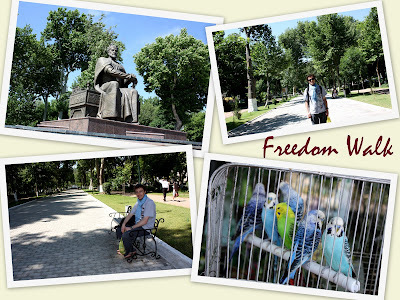 We had a nice enjoyable stroll, saw a large statue of Tamerlan and saw some beautiful parrots along the way. 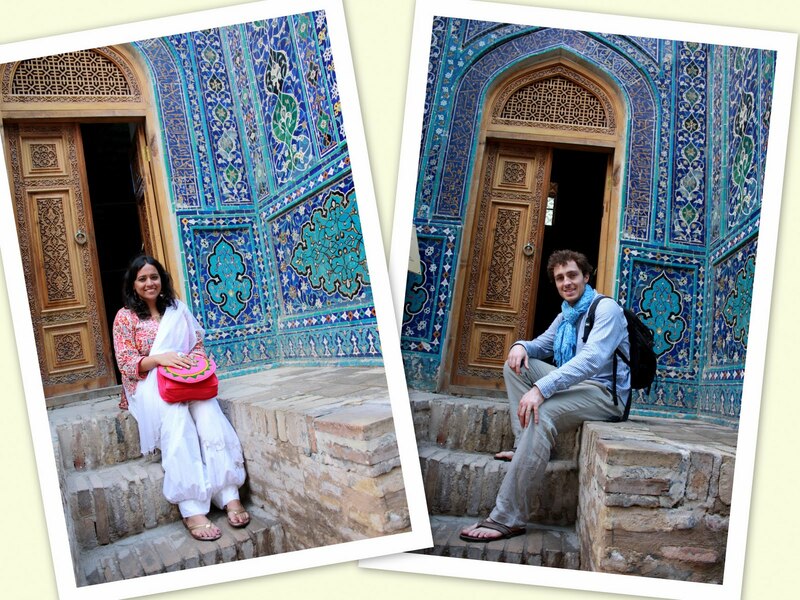 We ended up in the Bibi Khanum Mosque area and finally decided to have some drinks. It felt so good especially as it was really hot that day! 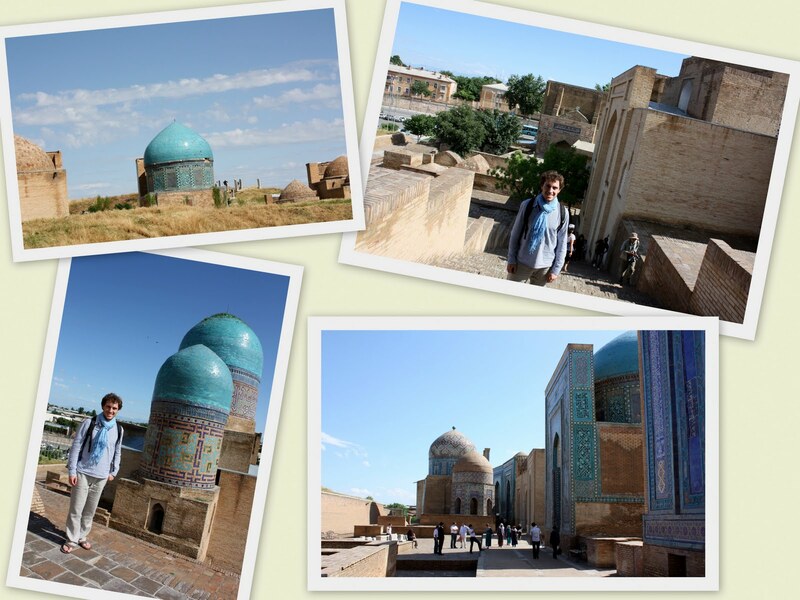 Funnily enough, we bumped into some local women we had met in Bukhara while walking towards the mosque. Although we did not immediately recognize them, they spotted us and were so excited to see us. It was so amusing as they gave me their address, photos of themselves and wanted my address too! I doubt they would ever write to me though, haha! Next up, find out more about the traditional Uzbek bread!!! Finally, we made it to Samarkand - a beautiful city full of historic treasures, rich culture and architectural wonders. Samarkand is probably the most well known city of Uzbekistan and this is because it enjoyed a central position along the Silk Road and Tamerlan had made it the capital of his empire. 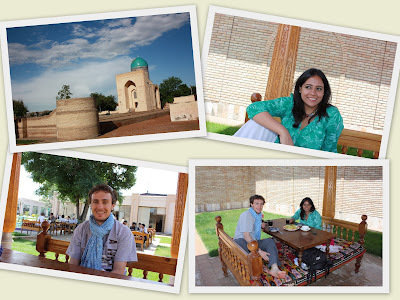 Our guide explained that the word Samarkand is derived from Persian and means rock (samar) fort (kand). The city was ruled by great conquerors such as Alexander the Great and King Eucratides before the onset of Islam. 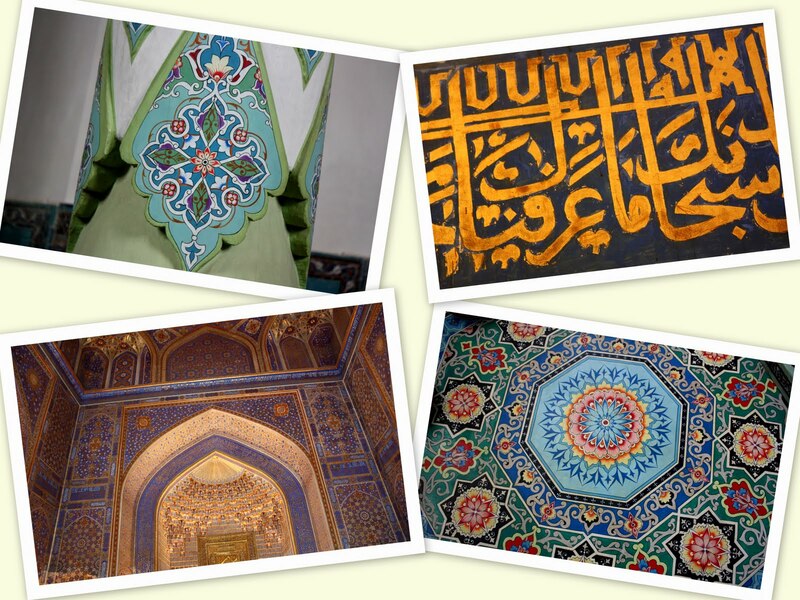 During the Islamic period, Samarkand was conquered by Arabs and flourished during this time. However, in the 1200s, Ghengis Khan destroyed a large part of the city. 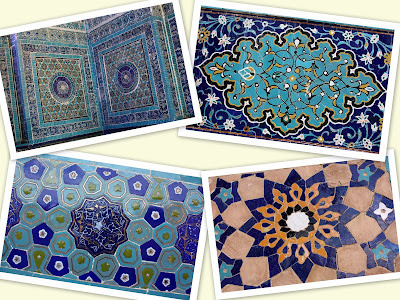 Luckily, Samarkand managed to re-emerge as an important trading center under Tamerlan's rule. Tamerlan is now the most revered person in Uzbekistan. For tourists, Samarkand has lots to offer. We started off by visiting the Amir Temur Mausoleum. This is where Tamerlan is buried and his tomb lies in this very beautiful and peaceful complex. No doubt, the most famous monument of Uzbekistan is Registan, a massive complex turquoise and sapphire colored stone buildings. 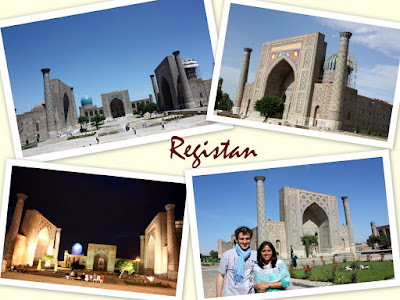 Registan means sand fort and is made up of three madrasahs and a mausoleum. Inside the madrasahs, there is a museum showcasing Islamic architecture and ornaments used to decorate the buildings. Also, we saw some traditional Uzbek style furniture. In the middle of the complex, there is a vast area which is now being used for holding concerts and large fairs. In the evenings, Sound and Light Shows in French and German are conducted especially for tourists. We managed to catch the show and the whole site was simply glowing in shades of red and orange in the dark. Another interesting site was the Bibi Khanum Mosque. 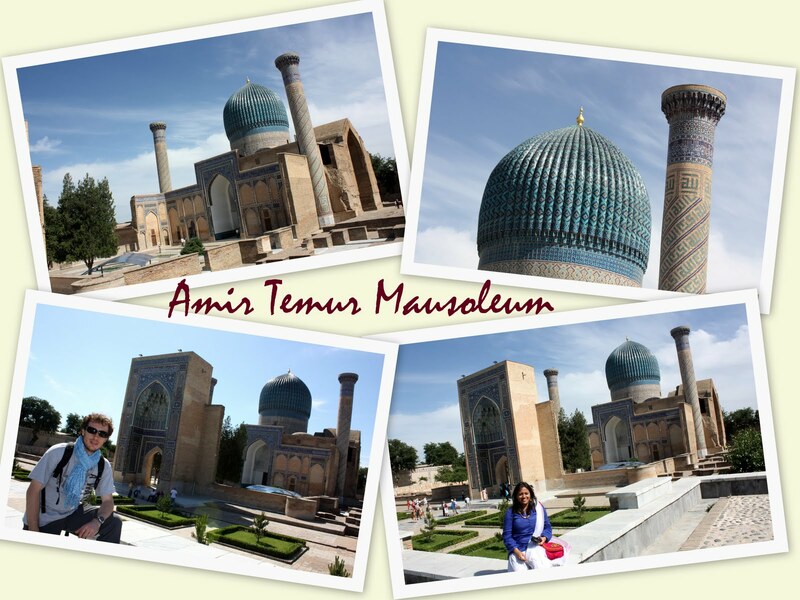 The mosque is named after Tamerlan's wife and was constructed using precious stones from India during his conquest of the country. The gigantic mosque was built in just five years but has very weak foundation and its condition has deteriorated over the centuries. It has been restored, however parts of it remain destroyed. At the centre of the complex, there is a marble Quran stand (bottom right photo). The locals believed that if a woman could pass through the hole, she would become pregnant. I did not see anyone doing that so I am not sure if they still hold on to this belief. 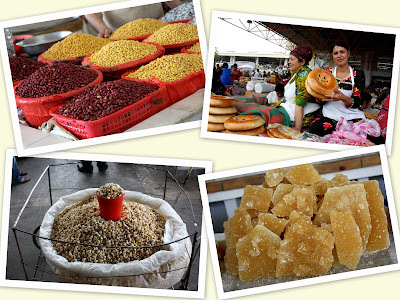 Very close to the mosque is a large bazaar where fruits, vegetables, spices, bread, meat, souvenirs and clothes are sold. I was mostly interested in the bread and spices and spent most of my time taking in the wonderful aroma. I ended up buying some traditional bread and fragrant cumin seeds. 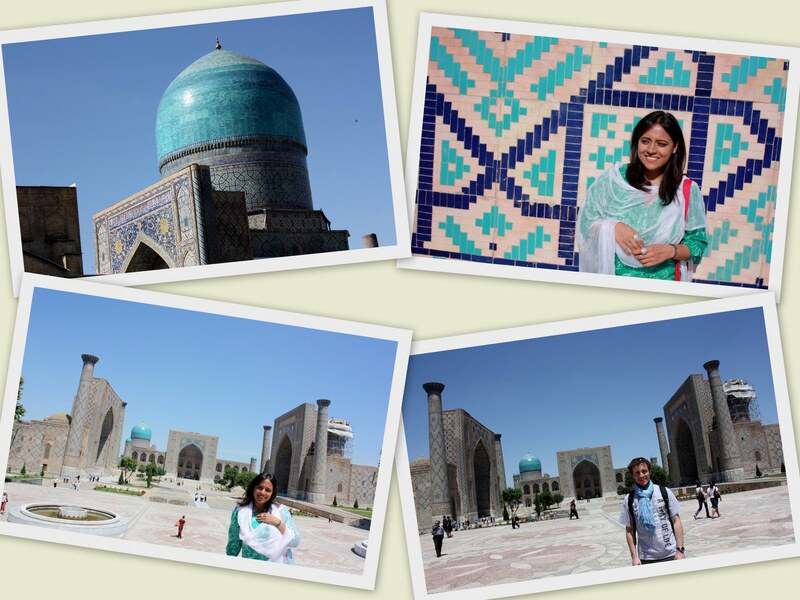 My favorite place in Samarkand was the Shahi Zinda Mosque. Shahi means king and Zinda means life, so this place literally means "the living king". I loved this place - it is so beautifully laid out that it almost seems like a village within a mosque. There are smaller paths within the complex that lead to elevated buildings where there are tombs of historically important figures and their families. Furthermore, there is a cemetery on the upper level of the complex, and people still continue to be buried there. The Shahi Zinda Mosque is regarded as a very holy place among Muslims. In fact, Muslims who are unable to or cannot afford to pay a pilgrimage to Mecca come here as it is often considered equal to Mecca. 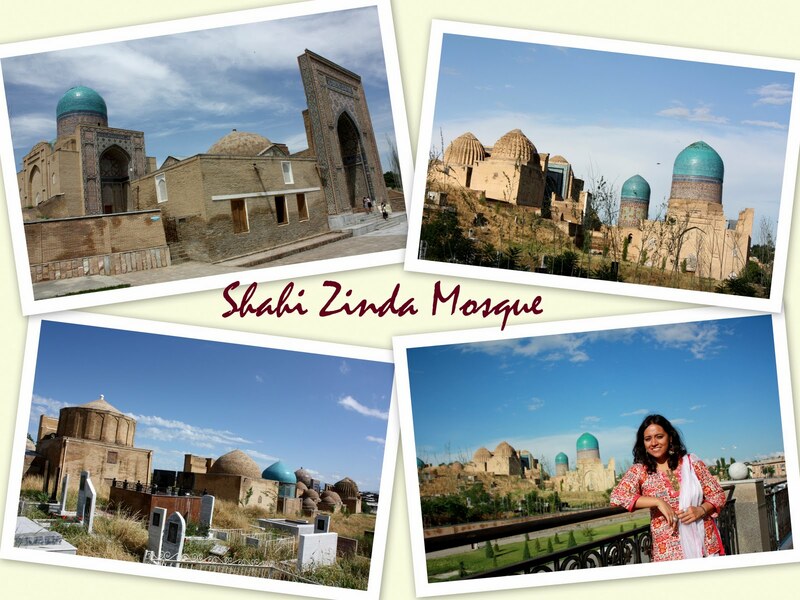 I thought that this mosque displayed the most variety in terms of architectural designs and stone work. I was just amazed by the colors and details of each structure- what a brilliant mix of blues and greens! I loved spending time at this place. It was so peaceful, although it felt eerie to walk in the cemetery! 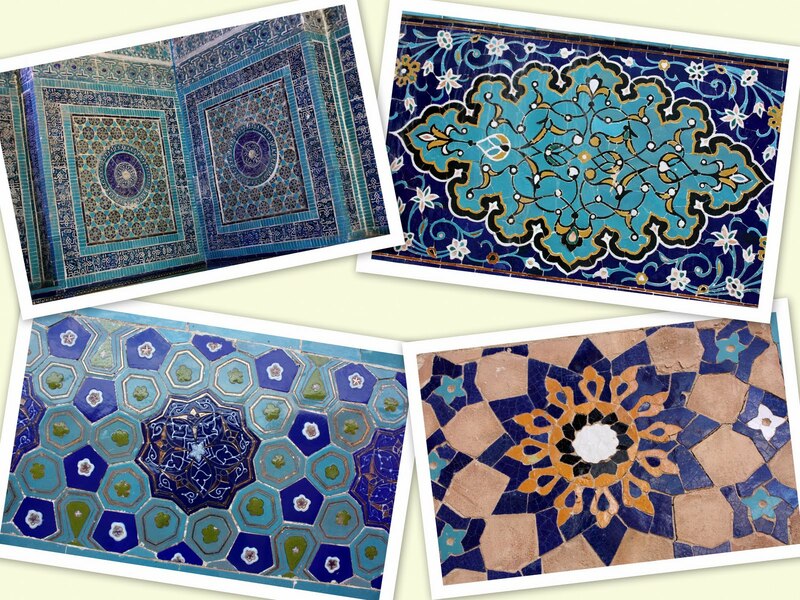 These are the must-see sites in Samarkand. There are other things you can do too, if you have free time, and I will write about this soon! Hopefully, I won't take too much time! About 90% of Uzbekistan's population are Muslim, 5% are Russian Orthodox and there is a small Jewish community present in the country. 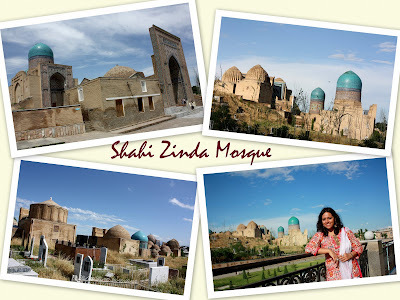 Both Shia and Sunni Islam are practised, however as Uzbekistan is a secular state, the religion is not as strictly followed as it is in other Islamic countries. This is also due to the Soviet influence and the locals are generally more open to modern ways of living. After gaining independence, the country is seeing gradual support growing towards Islam, and the president, Islam Karimov, introduced a policy banning all religious activities not approved by the state in order to prevent extremism. The most conservative and religious part of the country is Ferghana Valley and there have been some recent extremist attacks there. As Uzbekistan shares part of its border with Afghanistan, I was concerned that extremist groups like the Taliban would have a high chance of taking over Uzbekistan. Some locals tried to reassure me that the Russian military would be able to "take care of things". So far, the people have been enjoying their freedom, but who knows how long that will really last? Today, while Islam is the dominant religion, there are still some functioing Jewish synagogues and Russian Orthodox churches. Although Jewish and Christian holidays and festivals are not acknowledged, these people still believe in their faith and go to their place of worship whenever they can. Being female, I was especially interested to learn about the woman's role in Uzbek society. Historically, women were considered the inferior race and often stayed at home. The male was always the head of the family and made important decisions. It was mandatory for women to cover themselves from head to toe when out in public, for their own safety. The cape worn by women is known as the paranja. This garment covered their entire body and the black cloth covering their face was slightly translucent so that they could see through it. When walking in public, women had to maintain at least three steps behind their husbands and never walked ahead or at the same level! During the war against Islam, the Russians forbade women from wearing the paranja in 1927 and women threw away this garment in masses. Ever since, it is rare to find women wearing the paranja although, many still wear the hijab (head scarf) or the full body veil in more conservative areas of the country. I actually got the chance to wear the paranja! Here, I am actually at the same level as David and not three steps behind :)! Can you identify me??? Times have changed and I did not see even one woman wearing the paranja. In fact, in present day Uzbekistan, women mostly wear knee length dresses or skirts with leggings. Many of the local women we spoke to said that they can't wait to wear the dresses or skirts without leggings or shorter dresses without being stared at. Hopefully, for them, this will happen! We both also got the chance to dress up as wealthy Uzbeks. Check out the cool hat and colorful designs! I was very excited to dress up as an Uzbek bride! I love trying local clothes wherever I go and I especially found the Uzbek bridal costume very beautiful! 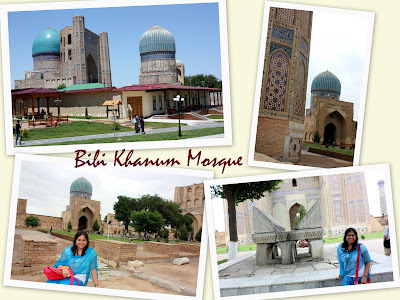 I am curious to know what happens in Uzbekistan's evolving society. With the Russian influence, religious extremism in some of its neighboring countries and a secular state, the country is definitely in a unique position and faces numerous challenges in terms of managing these very different aspects of life. Being a very hospitable and peace loving nation, I only hope for the best!